Earlier this week, we noted increasing reports of video distortion and other issues being experienced by users of Apple's new MacBook Air. According to BGR's new tipster with access to Apple's internal support documentation, the company is aware of the issue and will address it in a forthcoming software update. 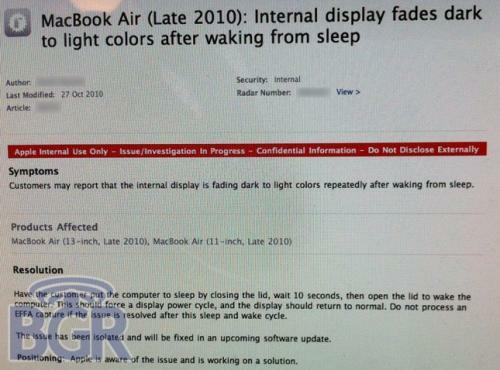 According to the support documents captured by the tipster, Apple has identified both "horizontal flickering" and "fading dark to light colors" as symptoms users may experience. 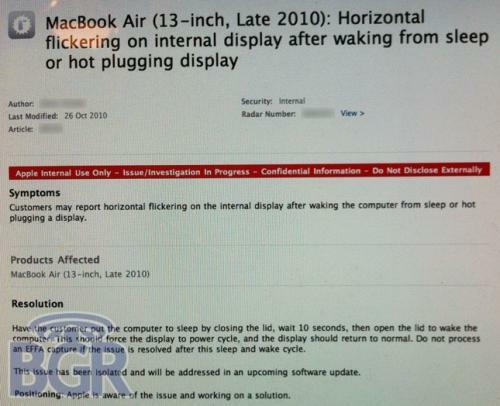 Until the software update is rolled out, support staff are advised to force a display power cycle on the customer's computer by closing the display and allowing the computer to sleep for ten seconds in an effort to address the issue. Have the customer put the computer to sleep by closing the lid, wait 10 seconds, then open the lid to wake the computer. This should force a display power cycle, and the display should return to normal. Do not process an EFFA capture if the issue is resolved after this sleep and wake cycle. The issue has been isolated and will be fixed in an upcoming software update. No timeframe for the release of the software update is known at this time.